In this first video Dr Paul Bedford sets the seen on how to identify your retention problem. How the White Report came about. How we derived a representative sample for the UK market. How we used 5 measures to identify the problems clubs have with retention and attrition and what that means to your business. Identify How NOT to Measure Attrition and why measuring attrition as a percentage is misleading and may also cost you members and money. We will identify which months of the year members are most likely to quit. Using risk rations we identify in which month customer is most likely to quit. The impact of and changes to retention by year of joining. The lack of impact gender has on retention and attrition. How Men and Women appear to differ when it comes to choosing operators. UK Fitness Market by age. How MOSAIC profiling useful for sales but not for retention. We will also demonstrate while the five different sectors attempt to offer different exercise experiences and appeal to various target groups, all five attract one predominant MOSAIC type. In the fourth video we look at the Retention and Attrition by sectors and price point. We look at how the results breakdown for the private sector by chains and independents. Identify how price point affects member behaviour and see how it has a greater impact on joining decision than on retention and attrition. In the fifth video we review the impact of contract length on Retention and Attrition. We examine the odds in quitting between different contract lengths from 1 month, 3 month, 6 month 12 month and longer and the affect of joining fees. We also explore the difference between when members stop paying and when they stop attending. This is the introduction to the Black report. 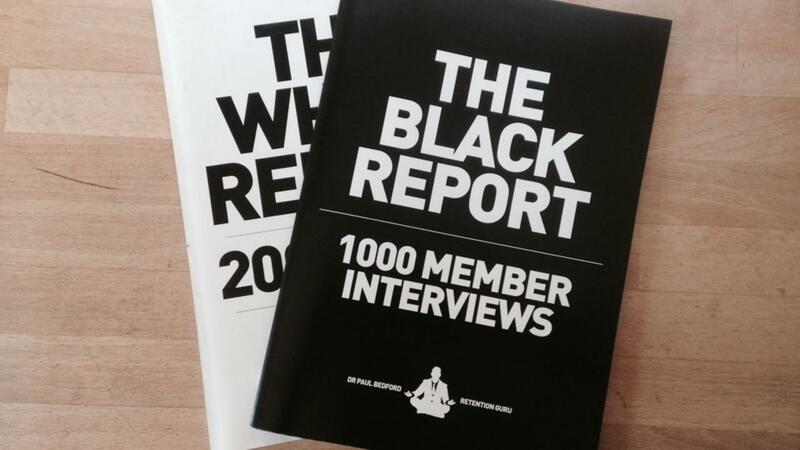 A review of the information collected from interviewing 1000 members who have been members of two or more clubs. How do members choose their first club, why they join, stay and leave and then how did they choose their second club, why they stayed and/or why they left. In this video we look at the impact and effect of gym inductions. What is the impact on retention when someone does have a gym induction. What members want from an induction, if they have one. How to have an impact on the Group Exercise orientation. How to assist members balance life style priorities, and club usage. The Wow of the first visit and its impact on member decisions to join. Understanding what drives motivation beyond traditional goal setting. The importance of community and clubs within your business. When to plan social events, to have the biggest impact. We explore the relationship between price and expectations of service. The value that members place on staff-to-member interactions. Prompting the next visits and the three interaction rule. When, where and how to interact.